I am so excited to have partnered with Product Of The Year team. I get to share with all of my super-duper readers, wonderful homecare products which have been voted as 2017’s Product Of The Year homecare product winners. As a wife and Mom of 4 little girls, I drown in dirty laundry, swim in baskets of clean unfolded laundry, and go through rolls of toilet paper like water. Seriously, what happens to all of that toilet paper, do the kids eat it? Geesh. I balance running a small business, raising little girls and running a somewhat clean and organized household. And I tell you what, without great products such as Downy Fresh Protect With Febreze Odor Defense, Snuggle Plus Superfresh Dryer Sheets, and Charmin Essentials Soft Bath Tissue, my life would be even more of a stinky mess. So let’s talk dirty laundry. Really, let’s just be completely honest. I HATE doing laundry. It smells, it piles up in a blink of an eye, and I swear I will die next to a laundry machine. I raise girls (10,8,6,4) and they can be just as dirty, if not more dirty, than little boys. My girls love playing outside with all of our animals, we have chickens, a rescued squirrel, 3 dogs, and a hedgehog; so you can just imagine what kind of dirty I am speaking about! Not only do I battle the stinky laundry smells of my littles, but also a husband who works 14 hour shifts in the operating room. Typical clothing odors and stains are one thing, but add in a hospital’s germs and smells, then you are dealing with a completely different entity. 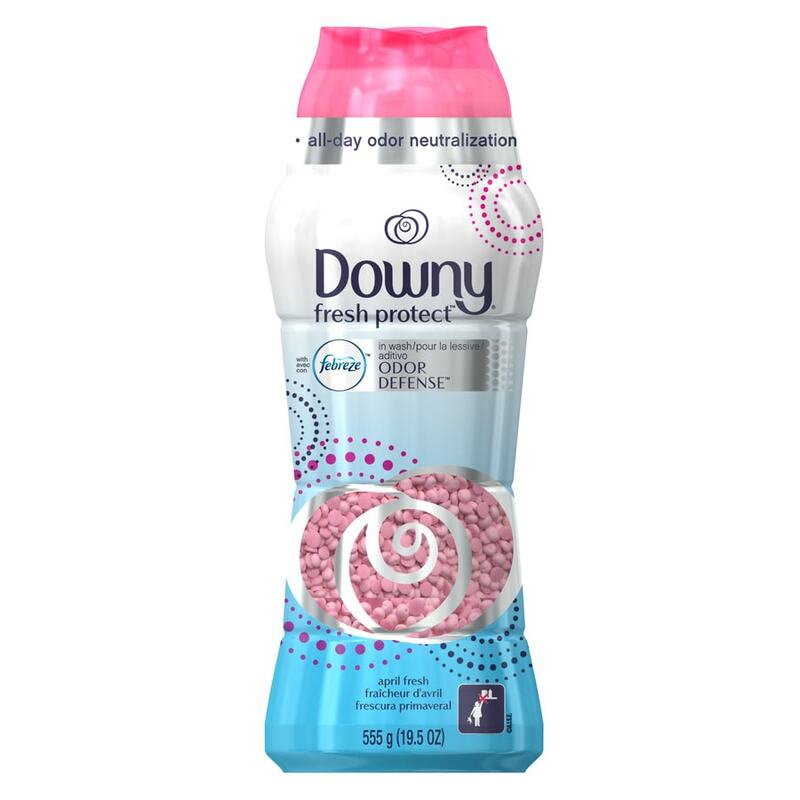 Because of my frequent, laundry disasters I am head-over-heels for Downy Fresh Protect With Febreze Odor Defense. This Downy Fresh Protect laundry booster has been voted 2017’s Product Of The Year and now I can see why you voted! This is basically a deodorant for your clothes! Squee, cue the happy tears! Downy Fresh Protect with Febreze Odor Defense is an in-wash booster that infuses your laundry with motion-activated technology to neutralize odors. This product is a part of the new Tide + Downy Odor Defense Collection, a laundry regimen designed to remove odors at the sources so odors don’t come back, wash after wash.
To make my new laundry regimen even better, I dry my family’s clothing with 2017’s Product Of The Year winner, Snuggle Plus SuperFresh Dryer Sheets. I know I am going to cause an uproar, but I never used dryer sheets….period. I was always the kid who had dryer sheets stuck to their pants or back of the shirt and I swore they never really served a purpose. Well, allow me to eat my words because Snuggle Plus SuperFresh has completely changed my mind! This award winning dryer sheet is the first-ever fabric conditioner and dryer sheet regimen designed to help eliminate tough odor. Snuggle Plus SuperFresh provides static control and includes patented odor-eliminating technology that delivers a strong and long-lasting scent to provide max freshness out of the dryer. Do you know what this means? This is life changing for my 5-6 clean laundry baskets begging to be folded. Now my long awaiting, pile of clean clothes will still smell fresh and clean by the time I get to folding them! Can we just take a moment and discuss how quickly a family of 6 goes through bath tissue? I swear the old brand of tissue I used to buy would disappear within 2 days. I gave my girls the lecture on how much to use and how not to waste, but it never failed because I was always replacing the rolls. When I was given Charmin Essentials Soft, I was excited. Charmin introduced the ultimate bathroom essential because “smart choices lead to big savings…and happy bottoms” and we all know that happy bottoms equal happy kids. I am all about saving money. Raising a large family can be financially straining and any way I can save a dollar here and there, well count me in! The first grab at Charmin Essentials Soft Bath Tissue and my girls yelled, “it feels like a blanket”. This 2017 Product Of The Year provides “Charmin-like softeness at an Angel Soft like price”. It’s a 2-ply toilet paper that is clog-safe, septic-safe and Roto-Rooter approved. Charmin Essentials Soft has saved my family money and has provided ultimate comfort in the potty room! Even though I don’t run a perfectly clean and tidy household and my life is always chaotic, I love having award winning products like Downy Fresh Protect and Snuggle Plus SuperFresh that make my life easier. Laundry is a never-ending-story in my house, but at least I have the ability and products to make my family’s clothes smell fresh (even if they sit in the basket for a week). The whole toilet paper issue? Well, the amount of times I have to change out the empty rolls have lessened significantly, thanks to Charmin Essentials Soft. And I believe our booties haven’t been happier!